Golf, in real life, never took root in me. I had friends who played, and invited me along. As a young sports writer I covered a couple of exciting tournaments. In college, I enrolled in a golf class my senior year and was even partnered with N.C. State's quarterback, a guy who later became a a club professional in Georgia. But just to get myself to the level of having a fun time socializing on the course, the time and money seemed prohibitive, and I had little of either as a newspaperman in my 20s. Put a video game controller in my hands, and it is a completely different story. 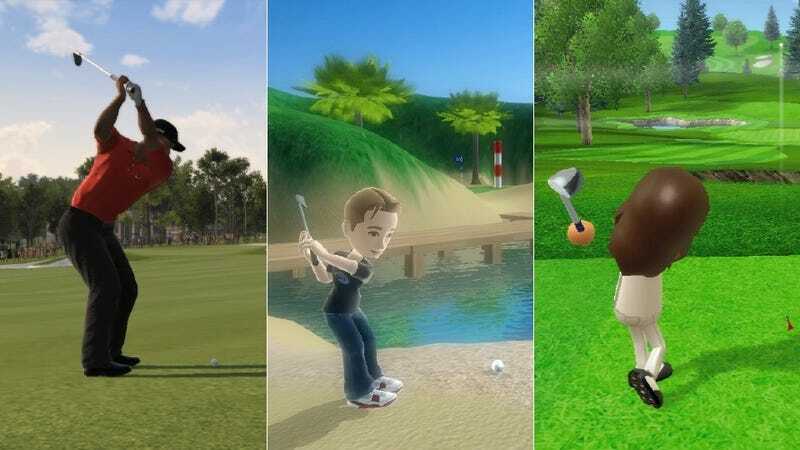 I have been up to 2 a.m. with Tiger Woods PGA Tour, sure; but also with Xbox 360's exceptional indie title Avatar Golf, and - yes, really - Wii Sports Golf. Give a perfectionist a short learning curve - and video game golf really flattens that out - and say goodbye. "Addictive," is the word every games marketer wants attached to his or her game these days, but not one you hear that much in sports - certainly not in simulation sports. And though franchises and careers and ultimate team modes can draw in players for a spread of reasons, for pure gameplay, for me anyway, nothing beats golf. Even shooting a 59 from black tees I've yet to play a round where I didn't leave a couple strokes out on the course, and that's enough to keep me coming back. "There's nothing more addicting than to knock a shot in the hole from somewhere off the green," said Justin Patel, likewise a video game golf addict who literally played his way into a job with EA Sports. "Just the sound of the ball going in the hole, once you do that with the game, I guarantee you'll sit there and keep playing, trying to do that again." Patel, 29, has been an assistant producer on the Tiger Woods PGA Tour series for the past seven months. (He destroyed me in a pre-release promotional event, firing 12 under at Augusta National on the first nine.) He won nearly every contest or giveaway offered by EA Sports for Tiger Woods PGA Tour from its 2008 to 2010 editions. "Any online tournaments, I'd win them most days," he said. That earned him enough notice that, after being invited down to preview Tiger Woods 11, and becoming one of EA Sports' "Game Changer" community leaders, he was eventually invited to help build the game. Patel laughed when I brought up the sheepish feeling of seeing the clock hit 3 in the morning, realizing how much sleep I'd lost to playing virtual golf. "There have been numerous times, back in the day, where I'd start play at 5 p.m. and next thing you know it's noon the next day," Patel said. He'd go online and find fellow addicts and, well, for compulsive behavior, that's the worst crowd to be around. "We'd be playing foursomes, 18 holes after 18 holes after 18 holes, over and over and over." This isn't to say sports gamers in other simulation titles don't play into the pre-dawn hours and go to work on short rest. Franchise modes and singleplayer careers present all sorts of role-playing objectives - recruiting talent, player management, practice, and what have you. On pure gameplay, though, I'd stand golf next to Angry Birds. "It's like, walking down a gravel road, you see that rock, you've got to pick it up and throw it and hit something with it," says Matt Davis, whose BarkersCrest Studio built Avatar Golf nearly two years ago. When it released as Avatar Golf in September 2009 (a successor to Easy Golf), Davis' $5 creation completely interrupted my console gaming habits. I was driven to shoot 69 or better from all three tees on each of its five courses, and it took forever. But I was up to 1 a.m. determined to prove something, even if I'd never brag about it out of shame. "There's a lot of feedback for how you did, every shot," Davis said. "You're constantly moving, it's not stagnant, you always have a new shot and a new hole no matter what you just did." Golf games have other features to keep players hooked, and in fact have to have them because once your scores have plateaued on every course, there's not much reason to come back. For Avatar Golf, it was the inclusion of a course editor. To date, the community has built more than 500 courses available for download, Davis said. In Tiger Woods 12, EA Sports added in "course mastery" badges that are, shrewdly, pegged to streak accomplishments and single tasks as much as they are whole-round goals. I've driven myself crazy trying to get a one-putt streak of three to unlock a silver badge for the Atlanta Athletic Club (on Tour Pro difficulty, in my defense). This, while a major tournament is waiting in my player's career, with other larger goals attached to that. I'm still out trying to eagle every par five at East Lake. The compulsion to do so comes from knowing I am completely in charge of the outcome. I'm not going to get garbage pitches when I'm trying to crank my fourth home run in a game. I'm not going to be suction-tackled every third down when I'm trying to seal the game winning drive. It's entirely up to me. It's a club setting, a distance to hit, and then can I hit the swing meter accurately, or can I move the right stick precisely enough, to pull off the perfect shot? When I don't, I can always point out what I did wrong. "When you play a team sport, you don't always have control over every player or everything," Davis said. "If you win or lose it may not be all on you, especially in multiplayer. You play golf, though, and you have nobody to blame but yourself." "Maybe the AI," Davis said. " ‘Oh, the AI cheated me on that hole,' of course."